B*llocks it's cold. When I say it of course I am referring to the ambient temperature, not to It, which might be implied by a wilful misreading of the proximity of 'B*llocks' to 'it's cold.' Mind, if we're going into intimate details, cycling along the West Bank Road does tend to chill certain contiguous organs, and since they then all shrink to the size of something that can be comfortably concealed by the next fullstop, I shall have to stop automatically deleting those helpful emails from Daina Yukiko Devinehlq offering me Our enlargement pills can show you, has the are recently. The West Bank Road gets no sun in winter and you can always find plenty of black ice which yields one of winter's pleasures, viz., boy racing. You indulge in wheelspins and skids and doughnuts all manner of exciting road adventures and yesterday I suddenly noticed in my little mirror that I was being followed by a big 4WD ute. It was driving *very* cautiously. I think he'd spotted what I was doing, and abruptly realised he was in some danger if he drove at normal ute speeds. He didn't overtake for ages, not till we reached a bit of dry road that had been warmed by the sun. 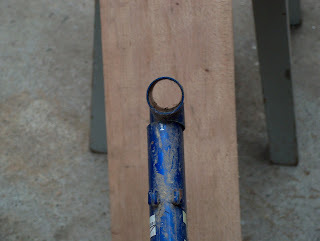 Cold, so time to do a little perfectly good mountain bicycle hacksawing. 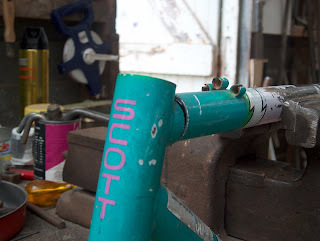 Sometimes I hacksaw to harvest bottom bracket shells and sometimes I hacksaw to get steering tubes and sometimes I hacksaw out of curiosity to see if the builder inexplicably filled all the frame tubes with molten lead or whether there's some other explanation for outrageous weight. Mountain bicycles have the two advantages that people are constantly throwing them away and that they don't use obscure British 1940s BB threads and that you get cantilever stubs off them, so that's three advantages, and that they yield long cage rear mechs, so that's four. Here is a Useful Tip for new cheapskate recumbent builders: always get perfectly good ladies' mountain bicycles in preference to perfectly good gentlemen's mountain bicycles. None of the parts will be worn out. Not even the chain. Ladies have no idea at all how gears work, so though their bike may boast fifteen of them, only one gear will ever have been used in its whole life. Once top gear has been achieved the lady will labour slowly along with her kneecaps popping, and being unaware of the possibilities of going back into a lower gear, will regard the bicycle balefully at the end of the ride and thereafter select the car for all future journeys. After seven years her husband will undrape the dust-laden blanket from it and put the machine, with crumbling brittle tyres and slightly rusty cables but otherwise intact, on the trailer and take it to the local Household Refuse Recycling Centre to be crushed into a skip. And here is another Useful Tip: as bicycles are only ejected from households of a Sunday morning, and as council officials can't abide for the public not to be forced to queue, you wait outside the town dump and ambush the line of cars at 10.40 am and offer every third trailer-load two quid for his bike. He won't accept the two quid if you try to look like a poor student bent on cheap transport. Do not discuss recumbents or hacksaws. Bike-chucker-outers won't give you them if they see the glint in your eye and the hacksaw in your hand. 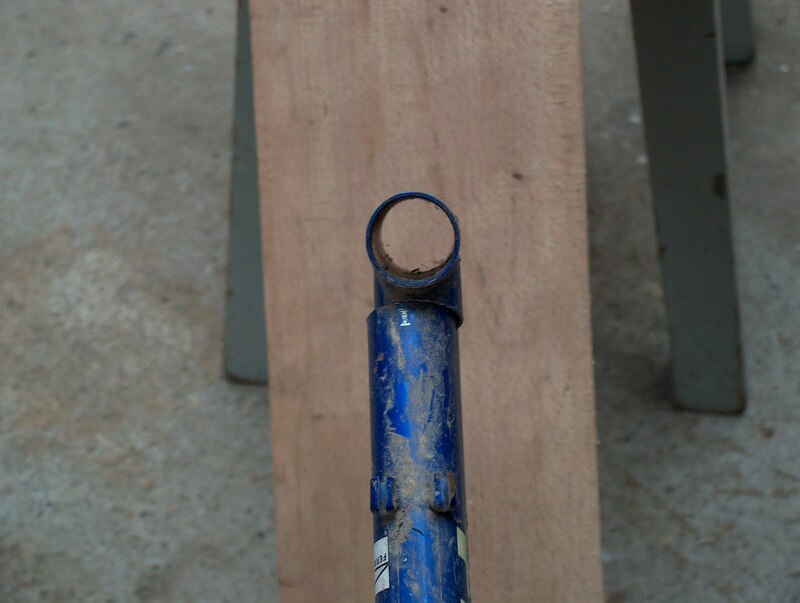 The interesting part of hacksawing a bike is how much the tubes spring apart. They do this every time. About 3.175mm. Internal stresses from the welding. The other interesting part is finding out that the steel is 1.5mm thick. Actually you can ascertain the wall thickness of frame tubes without recourse to a hacksaw: you poke a vernier into a bottle cage hole and then measure the OD across the same point. It amazes me that cheap mountain bikes have tubing of 1.5mm thickness and it amazes me that the OD of one tube will be 38.1mm and the other 50.8mm and it amazes me that bicycles this strong, which cannot physically be destroyed by any means not involving asteroid collisions, always bear the legend 'WARNING THIS BICYCLE IS NOT DESIGNED FOR OFF-ROAD USE OR STUNTING'. Then what is it, pray tell, designed for? - well, actually it's designed for propping up a blanket next to the freezer in the garage for seven years, that's what.